An attractive, unusual and rare shade plant for pots or shade gardens. 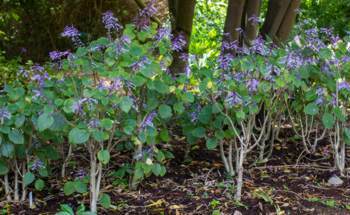 Plectranthus reflexus is a semi-succulent, upright herbaceous perennial. The leaves are opposite, succulent, triangular-ovate, with a gently-toothed margin up to 70 mm long and 50 mm wide, deep green above and purplish beneath, ranging in texture from thin and soft, in southern populations, to leathery and hairy in the north of its range. The young branches are square in cross-section and purplish. The grey stems, often supported by stilt roots, are swollen towards the base with relatively few branches, giving the whole plant a somewhat sparse but robust appearance. The plant ultimately reaches a height of about 800 mm. The inflorescence is an erect, terminal raceme arising from the tips of the growing stems, 150-200 mm long. The green calyx enlarges from 4-8 mm after the flower has fallen. The long thin tubular bright mauve corolla, up to 28 mm long, is distinctly swollen at the base narrowing to a throat and then flaring with the tips of the petals reflexed at the mouth. The brown nutlets are 1.5 mm long and nested in the base of the calyx. The flowering period is from late summer to autumn (February to May in the southern hemisphere). Plectranthus reflexus is Red Listed as threatened, most likely due to its very limited distribution range. 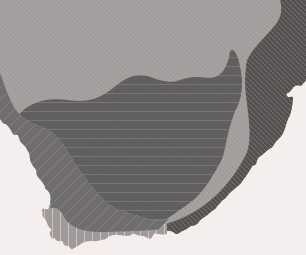 This species is restricted to the Eastern Cape of South Africa, from Port St Johns in the south to the Mkambati Nature Reserve in the north, with its distribution being somewhat fragmented resulting in local variability in its growth habit. It grows in well-drained humus-rich soils always on sandstone in heavily shaded kloofs and forests, often near streams. The specific name reflexus refers to the lower front lobe of the corolla tube which becomes reflexed as the flower ages. The discovery and first collection of the species was made in1989 near Port St Johns by Dr Ernst van Jaarsveld, chief horticulturist at Kirstenbosch National Botanical Garden. Plectranthus is an Old World genus of about 350 species inhabiting warm tropical and subtropical climates, principally in the southern hemisphere. Its range extends from sub-Saharan Africa through Madagascar, India and the Indonesian archipelago down to Australia and some Pacific islands. There are 53 species in South Africa. The genus is closely related to the genera Solenostemon and Coleus. 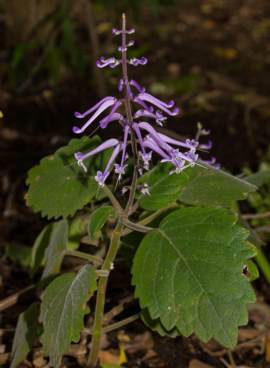 The ecology of Plectranthus reflexus in the wild is somewhat of a mystery, particularly with regard to its pollination. However, its abnormally thickened stem and unusually succulent leaves ensure that it is capable of tolerating a fair degree of drought. It receives an annual rainfall of about 1600 mm, mainly in summer, and would experience long periods of drought during winter. 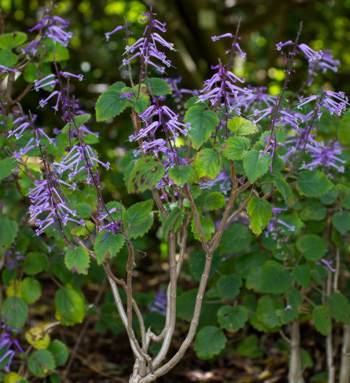 In frost-free, sub-temperate and subtropical climates Plectranthus species are universally recognised as excellent shade plants. They are also often used as house plants, and will often thrive in deep shade where many plants struggle for lack of sunlight. Almost unknown in cultivation, P. reflexus is especially well-suited to very shady areas.This species is versatile as a horticultural subject. It can be grown in shady rockeries, as a bedding plant, or as a striking pot subject, particularly well-suited for tropical and subtropical climates. 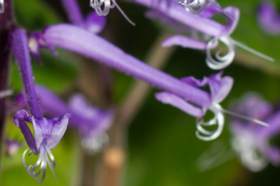 Plectranthus species are among the easiest and most rewarding of all plants to cultivate and this species is no exception. Cuttings can be made at any time of the year, but preferably in summer, consisting of short pieces of stem with 3 to 4 nodes. Strip the leaves from the lower 2-3 nodes leaving only about 2-4 leaves at the top of the cutting. No rooting hormone is required. During the cool months of autumn, winter and spring, the cuttings can be stuck directly into the ground where you ultimately want the plant to grow. This method works as long as the cuttings receive water approximately every 2-3 days during their first two months. 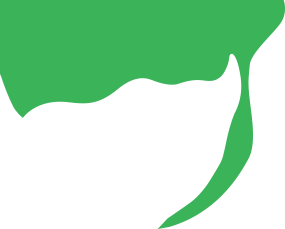 Alternatively, cuttings can be stuck in any rooting medium in pots or cutting trays under the protection of a nursery structure or propagation bench with regular watering or misting. Sow fresh seed in a well-drained seedling mix and cover very lightly with a thin layer of pure sand. This can be done at any time of the year but the warmer summer months are best. Seedlings often outgrow cuttings of the same age and are often more robust and better-branched in their growth habit, which is particularly prevalent in this species. The seedlings should be pricked out when they are a few months old and either planted into the ground or potted up. Young seedlings can grow rapidly and will flower within two years. Comapred to other Plectranthus species, it is quite slow-growing but can live for many years in cultivation. Individual plants branch sparingly, so if they are planted in a border, they should be grown fairly close together to achieve a full cover. Watering is only required once or twice a week. They don't require pruning, but a light trim in early spring will encourage branching. Feeding with a good layer of compost and/or organic fertiliser will stimulate vigorous growth and good flowering. They experience a semi-dormant period during winter when little growth takes place. Warmer conditions and longer days will stimulate new growth. Caterpillars and snails seem to be its only real enemies.